How do you know if you could be snoring, and what are the symptoms of snoring? Well for starters, if you make noises while you sleep or are told that you do; you could be. The noise I am referring to is the hoarse rattling or grunting noise often associated with snoring, and what I like to call; the rumble or rumblings in the night. Noise during sleep; hoarse rattling or grunting noise. Excessive daytime sleepiness; you feel as if you never slept the night before. Restless sleep; rolling around a lot and you often awake during sleep. Struggle to concentrate; the simplest tasks are a struggle to complete. Mood swings; getting annoyed and irritated by the smallest things. Bouts of feeling depressed; you don’t know why but you just feel down. Sore throat in the morning; see my article, Causes of a sore throat, for more on this. Dry or itchy throat in the morning; feels as if you have not drunk water in a month. Gasping or choking at night; mostly associated with sleep apnea, but can also indicate snoring. High blood pressure; get regular checkups to determine your blood pressure status. Headaches in the morning; regularly experiencing a throbbing feeling in the temple area. Chest pain at night; sometimes feels like anxiety or the start of a heart attack. Some of the symptoms of snoring above are mostly associated with sleep apnea rather than snoring, but can also be a sign of snoring, so I therefore deemed it necessary to state them as well. Consult a doctor if you suspect sleep apnea, because it is a very serious condition. Ensure that you act on these symptoms, and do something about your snoring. There are some very good anti snoring devices that can surely help you, there are even exercises that you can do to strengthen your throat muscles. 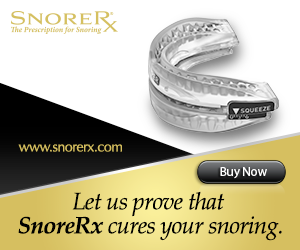 You can check out some of my reviews of stop snoring devices if you need more information. The point is; do something if you experience any of these symptoms of snoring, or if your partner insists that you snore. Make sure to get regular checkups.